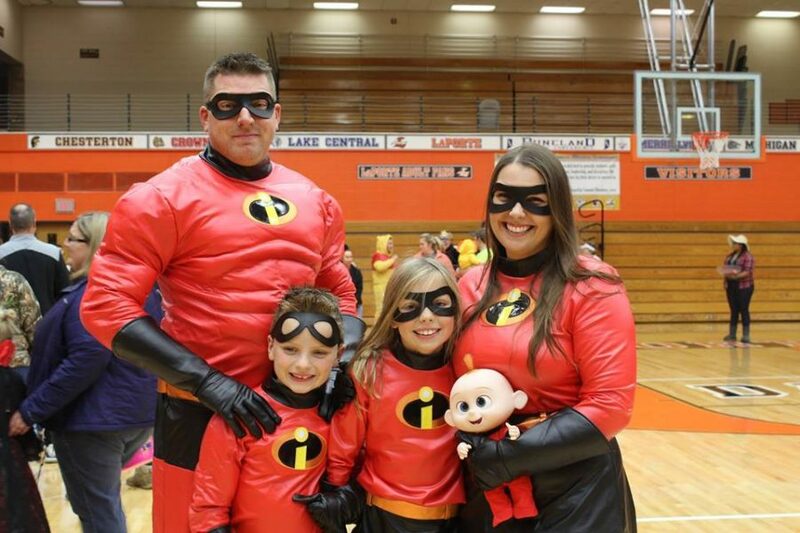 For the past five years, LPHS staff and students have dressed in their best costumes to pass out candy for the Special Olympics Trick-or-Treat. This year took it to a new level. Special Olympics Trick-or-Treat, which was held on October 25th, was a fun event for all who attended. Admission was $5 per child, with proceeds going to the Special Olympics, and lasted from 6-8 p.m. The idea of this trick-or-treat originally started when the LPHS Student Athletic Council saw a similar act being done at another school, and they decided it would be a great event to host at LPHS. Last week’s turnout surely did not disappoint. In fact, this year’s total topped all the previous years. Special Olympics received a check for $3,438.00 from La Porte High School due to their efforts. Each club and sport at LPHS was in charge of creating a booth for the trick-or-treat. Most groups decided on a theme to follow, and everyone dressed up accordingly. Children would walk throughout the hall and into the gyms gaining as much candy as possible. Some sports even added games to their booth, just for a little more fun. “I had a blast. Giving out candy to the cute little kids was fun, and it’s for a great cause,” Morgan Keen, junior softball player, said. Parents and relatives love bringing their little ones out for a short while, even if it means gaining a little more sweets than they would normally allow. However, kids enjoy more than just the candy, with the high school and middle school students making each station fun. “My kids loved to come and pass out candy and get candy. We do it every year because it’s a great cause, and the event brings our school together,” Mr. Presley, LPHS College and Career Readiness Coordinator, said. Thanks to the help of staff, students, and the rest of the community, the Special Olympics Trick-or-Treat was an enormous success. There is little greater than having fun and helping a great cause.